Show off who you spoiled most with our Personalized Cat Lover Photo Nightshirt. Your cute& adorable four-legged friend will always be with you as you snooze the night away in this unique nightshirt. Our Personalized Photo Nightshirt is available on our 100% combed ringspun cotton jersey v-neck personalized nightshirt, machine washable in sizes S/M or L/XL. Wear it to the pool, over jeans or to bed.Includes FREE Personalization! Upload your favorite digital cat photo below. Please don't send any photos in the mail, digital photos only. Please enter description of photo. (ex. Cat sleeping on sofa) Personalize your I Love My Cat Personalized Photo Nightshirt with your cat's name. 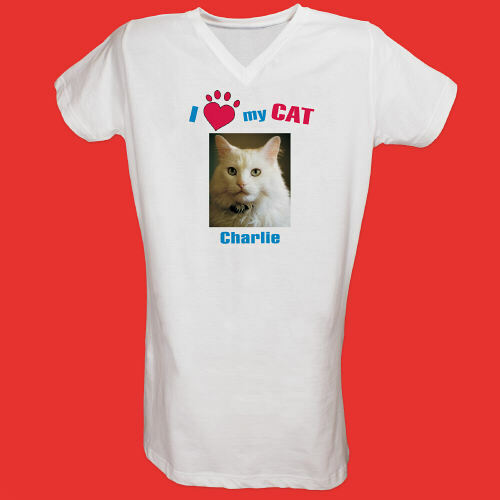 This Personalized Photo Nightshirt includes the text: I Love My Cat. Recommended pixel resolution (dpi) is at least 800 x 800. Take a peak at our entire collection of Personalized Checkbook Covers. Our Personalized Checkbook Covers make an excellent personalized gift for your favorite Cat Lover. Simply supply us with your favorite cat digital photo and we will take care of the rest.